If you need your area rug cleaning, Regina we can help.Â CleanRite is owned and operated by a master textile cleaner who has taken special courses on how to care for even the finest wool rugs.Â We clean all kinds of rugs from the $50 wall mart kind to hand woven wool carpets worth tens of thousands of dollars. CleanRite is currently providing in home cleaning of area rugs.Â Yes we can clean it over your hardwood floors and no it will not damage your hardwood.Â We have cleaned thousands of area rugs over hardwood and have never had any problems. Pre Vacuum Carpet - Using powerful commercial vacuum with hepa filter. Test for color fastness - Make sure colors will not bleed. 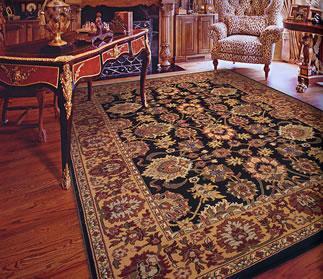 Pre Condition Carpet - Using a special product which is approved for wool or material used to construct the rug. Rinse and Extract using our state of the art truck mount systems. Treat any remaining spots or spills. Speed Dry using special air mover. If you just want a cheap area rug cleaned and you have no other carpets that need to be cleaned you may want to consider replacing the carpet unless it has sentimental value or it matches your room very well.Â It may be cheaper to replace a cheap carpet than it is to get the area rug cleaned. If you have any questions give us a call at (306) 721-2045 or visit us at www.reginacleaners.ca for more information.